Director Ridley Scott and Russell Crowe reunite once more — making this their fifth collaboration — for another historical epic in this drastically-different retelling of Robin Hood. The filmmakers replace the sort of sweeping romance and swashbuckling excitement commonly associated with the fables of Robin of Loxley with political intrigue and graphic battles. With high production values and a seemingly interesting, if not at least original, script, this contemporary look at the outlaw of Sherwood Forrest rewrites myth, as well as history, in order to create the story behind the legend. Unfortunately, this sword-wielding adventure tale across Medieval England aims a bit too high and ultimately misses its mark. 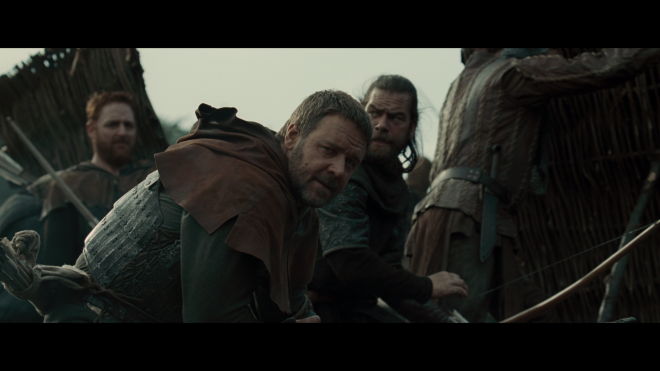 The film opens with Robin Longstride (Crowe) in the midst of warfare against France, supposedly fighting one final conflict of the crusades before heading back to England. Robin, who's just a common archer in the King's military (the first of several severe changes made to this wildly popular and well-known story), is friends with Will Scarlet (Scott Grimes) and soon befriends Little John (Kevin Durand) and Allan A'Dayle (Alan Doyle) on the battlefield. 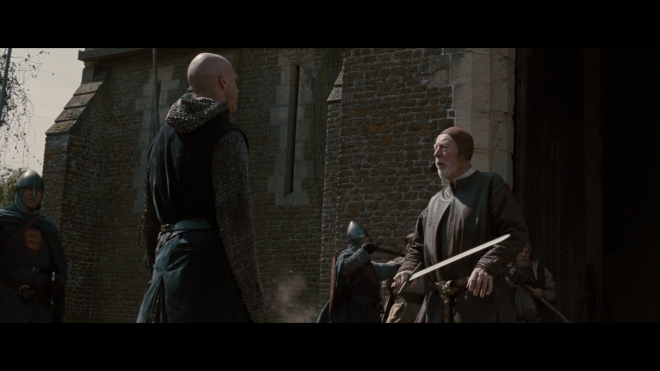 After the death of Richard the Lionheart (Danny Huston), the four men head back home and stumble upon Godfrey (Mark Strong) stealing the crown from Sir Robert Loxley (Douglas Hodge). The baldheaded man is quickly chased away, and Robin promises to return Robert's sword to his father in Nottingham. It's at this point that it suddenly dawns on us — that is, if you didn't already know the plot before watching the film — this is not the Robin Hood fairy tale we've come to love and remember. Many of the same archetypes are now introduced at different periods in his journey to becoming the symbolic hero against tyranny and the abuse of power. Scott's Robin is literally an impostor, posing as Robert, husband to Lady Marian (Cate Blanchett) and son to Sir Walter (Max von Sydow). Friar Tuck (Mark Addy) and the Sheriff of Nottingham (Matthew Macfadyen) also make minor appearances, but they come off more like cameos than important figures. 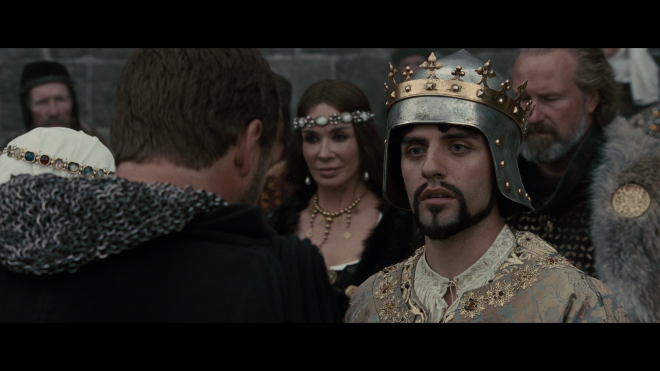 King John (Oscar Isaac) still plays a major role as the selfish, juvenile ruler, but his personal fight with Robin doesn't come to fruition until much, much later. While there may not be a single agreed-upon story of Robin Hood and his Merry Men, this version to English folklore is quite a bold move on the part of the filmmakers. To restructure the original setting of a beloved classic and reconfigure an entire narrative that has been passed down for hundreds of years is pretty daring and different, to say the least. But it's not a wholly satisfying experience either, mainly because it feels like we're forced into waiting until the final moments for the real story to at last begin, almost as if the preceding 140 minutes were nothing more than exposition. And the several allusions to real historical events, such as the Magna Carta, only succeed at muddling things further. On the other hand, I have to admit I can appreciate the attempt at trying something new and unexpected. Time and time again, Ridley Scott has proven himself to be an amazing director. He knows how to capture the drama without it turning overly sentimental, and balancing it with genuinely exciting sights of warfare and action. 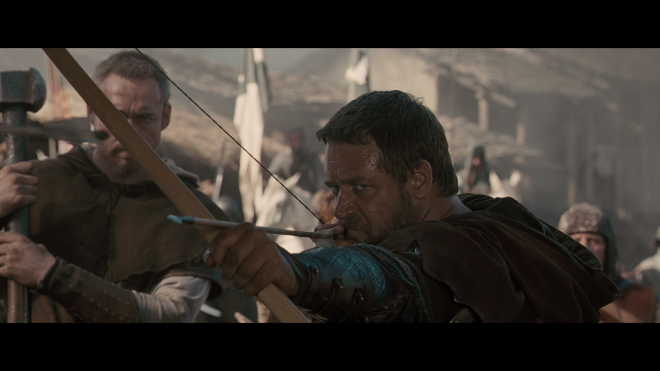 And Robin Hood is honestly no different, as it looks beautiful and is mildly entertaining. The photography of John Mathieson (Gladiator, Kingdom of Heaven, The Phantom of the Opera) is marvelous and gorgeous too. But the script has so greatly altered the original tale that filmmakers probably should have changed the title as well in order to temper expectations. 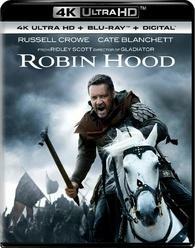 Robin Hood is really a revisionism of myth, situated within a historical arena so as to create authenticity. But Scott's film fails at capturing the essence that transformed the hero of medieval ballads into a legend. The plot is essentially a prelude to the myth audiences are actually anticipating and leaves them hanging for a sequel. Sadly, at this point, we're not entirely sure we want to see what's next. Universal Studios Home Entertainment brings Robin Hood to 4K Ultra HD Blu-ray as a two-disc combo pack with a Digital Copy code. When redeeming said code via UPHE.com, Movies Anywhere or VUDU, users only have access to the SD and HD SDR versions with Dolby Digital Plus 5.1, but it's available in 4K via FandangoNOW. The triple-layered UHD100 disc sits comfortably opposite a Region Free, BD50 disc inside a black, eco-vortex case with a glossy slipcover. At startup, the disc goes straight to a menu screen with a static image of the cover art and music playing in the background. Robin Hood rides against tyranny and the abuse of power on 4K Ultra HD Blu-ray with a somewhat disappointing HEVC H.265 encode that still offers some mild improvements over its HD SDR counterpart. The movie was originally shot on 35mm film and mastered to a 4K digital intermediate, but the 2160p video looks as though upscaled from the same HD source used for the Blu-ray. The transfer fluctuates between excellent definition and poorly-resolved, and natural film grain is made more prominent in several areas, almost to the point of looking noisy. The picture exposes every defect and blemish of the wood and stone bricks in the production design with notable lifelike facial complexions in one scene and suddenly soft and blurry with instances of mild aliasing the next. There are several instances of ringing in several scenes, which periodically looks like thick haloing. Colors don't appear to benefit much either although primaries enjoy a debatably small boost with reds, in particular, looking fuller and slightly deeper. The overall palette doesn't really show a great deal of variation with secondary hues feeling largely limited and flesh tones mostly seeming flushed and pale. However, explosions admittedly come with richer, more true-to-life fiery oranges. The epic war drama rides into action with an excellent and generally satisfying DTS:X soundtrack, but it's not a drastic improvement over its DTS-HD MA counterpart. In fact, the upgrade isn't entirely that much different, maintaining almost all the action in the surrounds. The sound design generates an enveloping soundscape, as the sounds of wildlife and nature discretely travel between the fronts and sides. Directionality is seamless and convincing, creating a highly enjoyable 360° soundfield that beautifully immerses the listener into this medieval world. Occasionally, some of those same atmospherics pan into the overheads with amusing effectiveness, but they fail to create a convincing hemispheric environment. Truth be told, the ceiling channels are pretty silent for a majority of the runtime. Director Ridley Scott and Russell Crowe reunite for Robin Hood, a drastic revisionist telling of the well-known myth placing the legendary hero in a gritty historical world. 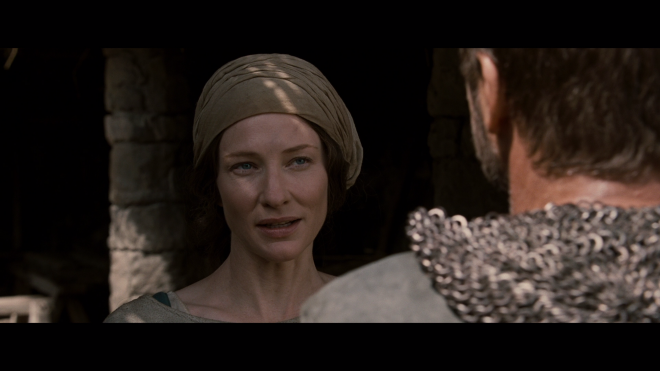 Co-starring Cate Blanchett, William Hurt, Max van Sydow and Oscar Isaac, this sword-wielding adventure tale across Medieval England aims a bit too high and ultimately misses its mark. The movie steals from the rich and gives to 4K Ultra HD Blu-ray with an average and somewhat disappointing HDR10 presentation but a better, enjoyable DTS:X soundtrack. Charging forward with the same set of supplements as the Blu-ray, the overall package is ultimately for fans only or perhaps worth a look when on sale.